Before sharing this month's freebie, I have to tell you about a change at this blog. While I was taking the break, I had been thinking about how I can make my life (as a mom to two kids, an illustrator for TSG, and the owner of Birdie Brown) more easy. And one of the decisions I've made is that I stop "Customer's Project" post. Even though I won't have "Customer's Project" post anymore, I really like to see what my customers make with my digital stamps. And I believe that your fabulous works inspire somebody. 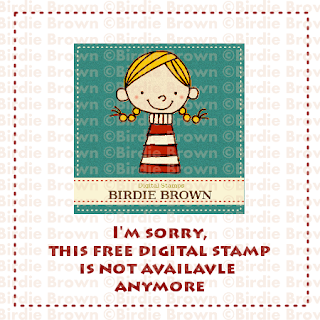 So please feel free to share your creations using my digital stamps on my Facebook page! If you have any questions about this change, please email me at birdiebrown55-at-gmail-dot-com. I'd love to see what you create using this month's freebie! * Add a direct link to your cards/projects using this month's freebie in the Inlinkz that is located at the bottom of this post. * Please include a link to this post in your blog post so that your readers will know where you got the image you used. * Please DON'T put the original digital stamp on your blog. I have to regard it as redistribution. * The collection will be closed at 11:59pm EST January 31. 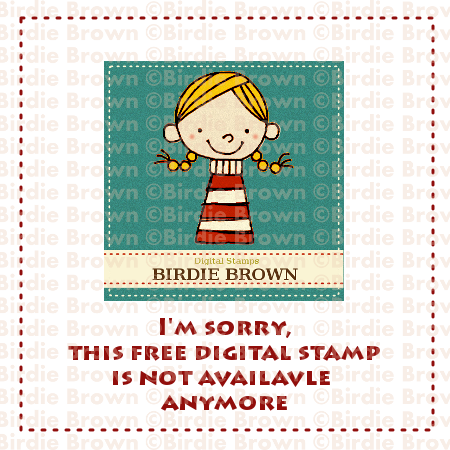 Then one lucky person will be chosen randomly and will receive 3 digital stamp from Birdie Brown. * You can enter as many times as you would like. The more you enter, the more chance to win! Here is my sample card. Make sure that your cards/projects don't need to be for Valentine's Day. Birthday, friendship, thank you... any theme is OK! Cutest ami digi, ever! Thank you, Torico! Thank you Torico... he is gorgeous!! And I now have learned about amigurumi too! Happy New Year and welcome back. Love the new digital...so cute. Thank you! Such a cutie and so is your card. Thanks so much! Thank you, Torico! The image is adorable! Happy New Year! Adorable!! Thank you so much!! He melts my heart! Thank you! Just too cute and I learned something about this type of bear that I didn't know before! Thanks for the freebie image...hope to color him up soon! Super sweet...thank you for the freebie...Happy New Year! Happy New Year!!!! Thanks for the Freebie and I intend to play along in the challenge with it too!! Hugs!!! Have a marvelous weekend.take care of yourself and stay warm. Thank you so much for the adorable image! Love your card! THank you Torico for this adorable bear. So pleased you are back, Torico! This is super cute - I'll be colouring him tonight!!!! forgot to say - thank you! Super sweet image! Thanks so much for sharing and also for the links! Hope you had a nice break and it is wonderful of you to share such an adorable image. Thanks. A great start to the New Year with this cutie! Thanks! Thank you for the freebie - I just found your blog - I entered your challenge -your card creation sample is lovely! Thanks for the challenge and have a wonderful day! Another adorable image; thank you! Thank you for sharing your talent w/ us. Yes, of course! Your project doesn't need to be a card. A tag, an altered item, a gift bag and so on... anything is OK as far as you use the Amigurumi Bear image. Thank you so much for the freebie I have him colored up and will post it for the challenge. Adorable! Thank you for the freebie! I hope to get a chance to color him for the challenge. Thank you I love your stamps, they are so cute! Thanks again for the adorable image, Torico! I am back with my card for the challenge! I enjoyed playing along! TY for the freebie Torico! I really enjoyed this one Torico - particularly learning something new in the process. Thanks. A beautiful bear. Thanks for sharing. Thanks so much! He is so cute. This is the cutest bear ever! Thank you for sharing your talent w/us to enjoy! Thank you very much, I loved this stamp! Thanks for the cute image and chance to win a few more!! Hope you had a relaxing vacation. Thank you for the super cute image and a chance to win more great digital stamps. Thanks for the challenge! Thanks for the adorable freebie. The colouring on those balloons is amazing!